VASYLKIVKA, Ukraine -- In this war-torn country where countless tears have been shed for grief, Nadezda Panasyk cried for joy. Nadezda Panasyk, left, holds her cat Pushok while and Ianna Cherkashena, age 2, looks on in the apartment they share with Ianna's mother and sister in Vasylkivka, Ukraine. "Thank you America," the elderly widow said again and again as she watched workmen deliver a new bed to her new apartment, which she shares with a new family and a new cat. Five months ago, Panasyk, 75, was marooned in a battle zone in separatist-held Donetsk in eastern Ukraine. 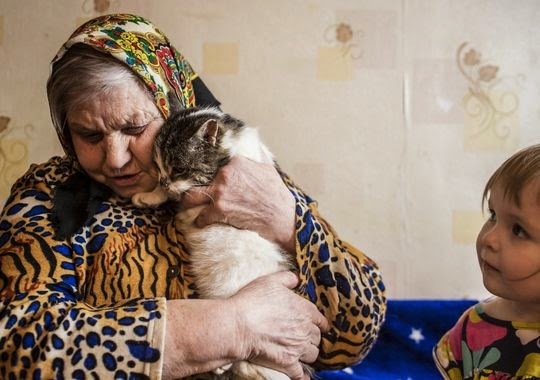 She was the last civilian living in a shell-pocked apartment building Russian-backed rebels were using as a command post in their fight with government forces at the Donetsk airport. I met her there during an artillery exchange. She told me she had no family or friends to turn to, and she didn't want to leave behind her dear companion, a cat named Pushok (Fluffy). I offered to take her and Pushok to safety. She was upset when she had to be separated from her cat because the shelter that took her in did not allow pets. When I wrote about her predicament, USA TODAY readers offered to donate money to find a home that would reunite Panasyk and Pushok. I directed them to Polish Christian Ministries, which has a branch in Troy, Mich., and delivers aid to Bethlehem Pentecostal Church here, where Panasyk landed. Donations and letters poured in from seniors, animal lovers, children and even prison inmates. Shayla Rogers, of Simpsonville, S.C., wrote that her children, ages 8 and 11, donated $6 and $5 from their allowance "to help this poor lady." Other donations were as large as $1,000, amounting to about $10,500 in total. The funds were enough to buy a two-bedroom apartment and furniture for Panasyk and her caretakers, a woman and two young daughters who have become a surrogate family. Panasyk has gone from collecting apples from neighbors' yards for food and living alone in an unheated studio apartment to living with a loving family — and a new washing machine. She is more fortunate than many. Ukrainian civilians in eastern provinces seized by the pro-Russian separatists have suffered from the conflict. Many homes have been damaged or destroyed by shelling. More than 6,000 people have been killed. The Ukrainian government cut off pension payments in rebel-held areas. Elderly pensioners have died from lack of food and medical supplies. Ukraine's Ministry of Social Policy registered 980,000 displaced people in February, and 600,000 Ukrainians have sought asylum in neighboring countries, according to the United Nations. Panasyk's housemate, Lena Cherkashena, 35, left Donetsk after her home and her parents' home were damaged in the shelling. Cherkashena's husband stayed behind to repair the buildings. Despite a cease-fire agreement signed Feb. 11 and a lull in the fighting, she is staying put. "There's no work, no social payments, everything is destroyed. There used to be a regular food supply, but now it's only monthly," Cherkashena said. Cherkashena watched with a smile as her daughters played with a pet rat, Mashinka, and a new kitten that Bethlehem Pentecostal Church Pastor Aleksei Barkalov gave Panasyk. Named Pushok the Second, the kitten looks like Pushok. A rebel defense official who took custody of Panasyk's cat gave it to a friend whose family became attached to the animal and didn't want to give it up. Panasyk sat on the couch telling her life story. Her father died in World War II and her mother struggled to care for six children. She stroked the cat on her lap, and joked with her "granddaughter" — Cherkashena's daughter, Ieva, 5 — at her side. Before we parted, Pastor Barkalov, who is also helping many other people, gave a prayer of thanks to American readers. He urged me to remind them that while Panasyk and her cat were fortunate, many in his flock are still in limbo and would benefit from continued generosity. To do so, please direct funds to Polish Christian Ministries for the care of Ukraine Project, P.O. Box 99617, Troy, Mich. 48099-9617.